Green Day performed a mini-set from Tampa, FL in a live Facebook feed streamed by hennemusic on September 5 as part of a fundraising event for those affected by Hurricane Harvey, and video of the event is available online. The 10-song, 30-minute Tuesday afternoon set was delivered live from backstage at the MidFlorida Credit Union Amphitheatre in Tampa, where the group were performing later the same night. 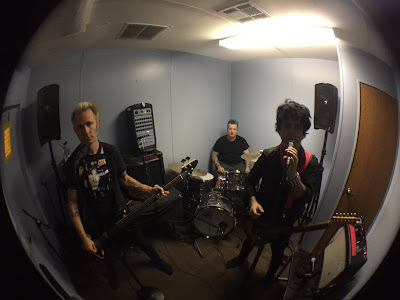 Green Day mostly played rare tracks not regularly featured in their 2017 tour setlist, including “Only You” from their 1989 debut EP “1,000 Hours”, “Paper Lanterns” from 1990’s “Slappy” EP, “Christie Road” and “One Of My Lies” from 1991’s “Kerplunk!”, “J.A.R. (Jason Andrew Relva)" from the 2001 compilation "International Superhits! ", and “Coming Clean” from 1994’s “Dookie”, which made its first appearance since 2013. According to Billboard, Green Day pledged $100,000 to the health-focused relief group's efforts. "Americares is truly grateful to have Green Day's support," says Americares President and CEO Michael J. Nyenhuis. "Their generosity and dedication means so much to us, as we restore health and hope for those affected by Hurricane Harvey." Green Day are encouraging fans to donate to Americares over the next week by texting HERO to 20222 for a $25 offering, or via the charity’s website here.